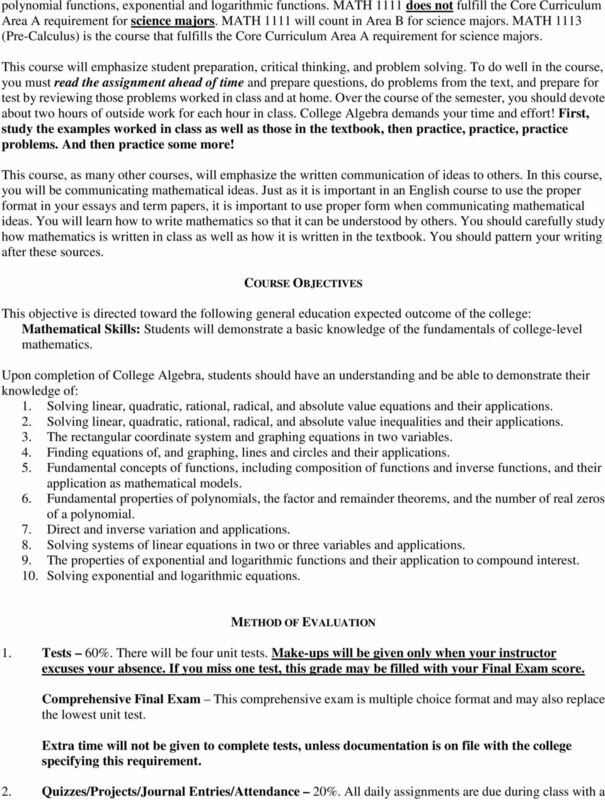 Download "MATH 1111 College Algebra Fall Semester 2014 Course Syllabus. Course Details: TR 3:30 4:45 pm Math 1111-I4 CRN 963 IC #322"
3 20% penalty for assignments coming in late on the same day and a 0 for all missed deadlines. 3. My Math Lab Homework 20%. Purchase the access code before the end of the first week of class! All deadlines are class time on the day of the test. Don t let things snowball. OFFICE HOUR PROCEDURES When you come to my office for help, please be prepared by doing the following. 1. Bring your textbook, your calculator, and your class notes. 2. Make sure you have read the section in the text, read the class notes, and studied the examples. 3. Be prepared to show me at least two odd-numbered problems from the section that you have worked. 4. Bring your incomplete or incorrect solution to each problem about which you have a question. 5. Ask for help as early as possible. Don t wait until the day of a test. OTHER INFORMATION A. Attendance: Attendance at class is important. I will take attendance by using an attendance sheet. Students are responsible for every instruction, every change in the syllabus, and all material covered in class whether or not they are present. Students who enroll in the course late are responsible for material covered before they enrolled. B. Working Problems: Most students will benefit by working many, many problems for practice. 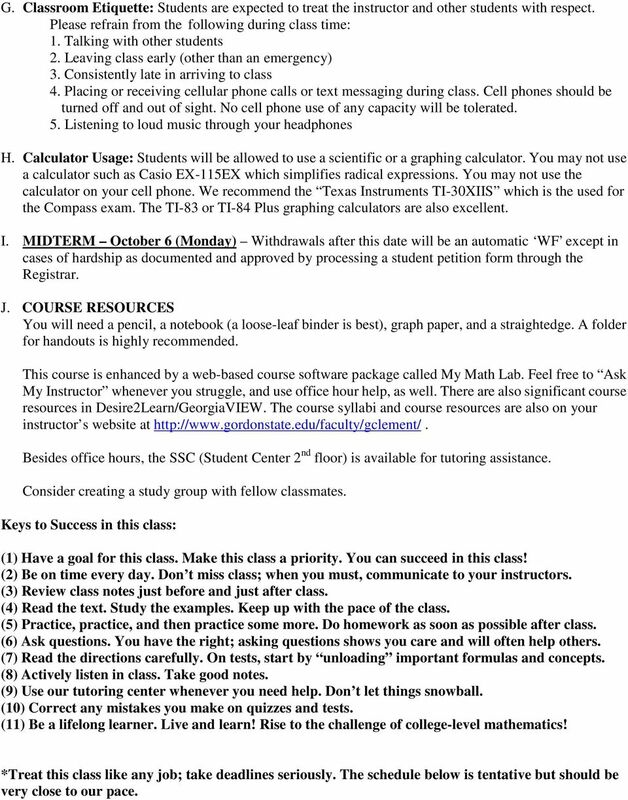 On the Tentative Course Outline is a list of suggested problems for each section covered. These are intended to give the student practice in specific concepts that are taught in class. The problems will generally not be graded. However, I strongly encourage you to work them to better prepare for the tests. I will typically use the first few minutes of class to answer any questions about the homework problems. Math is not a spectator sport! C. Group Work: Feel free to work together on homework, but make it your goal to understand the material and develop the skills that we are modeling in class. D. Academic Honesty: Each student must do his or her own work on each assignment without any assistance from any outside source. The penalty in our class is a 0 on the assignment and a report to our school MPS department chair. 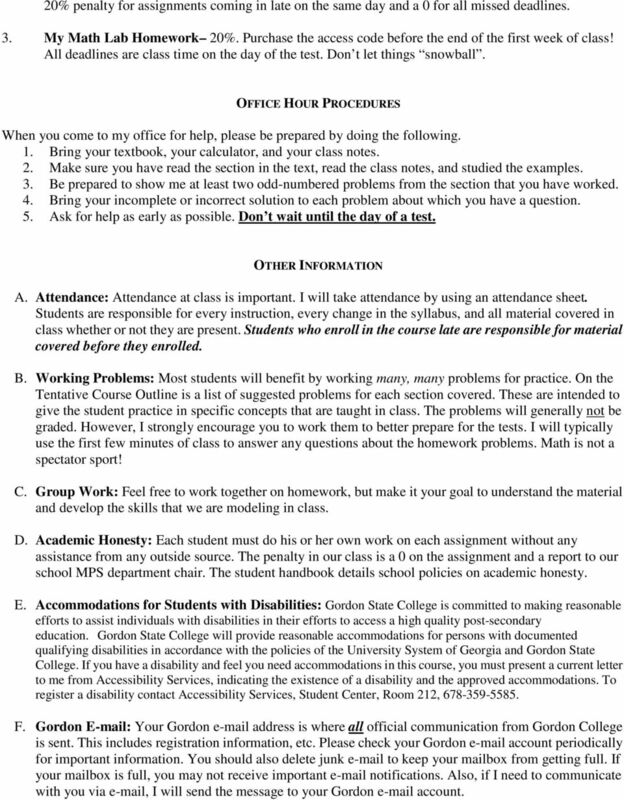 The student handbook details school policies on academic honesty. E. Accommodations for Students with Disabilities: Gordon State College is committed to making reasonable efforts to assist individuals with disabilities in their efforts to access a high quality post-secondary education. Gordon State College will provide reasonable accommodations for persons with documented qualifying disabilities in accordance with the policies of the University System of Georgia and Gordon State College. If you have a disability and feel you need accommodations in this course, you must present a current letter to me from Accessibility Services, indicating the existence of a disability and the approved accommodations. To register a disability contact Accessibility Services, Student Center, Room 212, F. Gordon Your Gordon address is where all official communication from Gordon College is sent. This includes registration information, etc. Please check your Gordon account periodically for important information. You should also delete junk to keep your mailbox from getting full. If your mailbox is full, you may not receive important notifications. Also, if I need to communicate with you via , I will send the message to your Gordon account. 4 G. Classroom Etiquette: Students are expected to treat the instructor and other students with respect. Please refrain from the following during class time: 1. Talking with other students 2. Leaving class early (other than an emergency) 3. Consistently late in arriving to class 4. Placing or receiving cellular phone calls or text messaging during class. Cell phones should be turned off and out of sight. No cell phone use of any capacity will be tolerated. 5. Listening to loud music through your headphones H. Calculator Usage: Students will be allowed to use a scientific or a graphing calculator. You may not use a calculator such as Casio EX-115EX which simplifies radical expressions. You may not use the calculator on your cell phone. We recommend the Texas Instruments TI-30XIIS which is the used for the Compass exam. The TI-83 or TI-84 Plus graphing calculators are also excellent. I. MIDTERM October 6 (Monday) Withdrawals after this date will be an automatic WF except in cases of hardship as documented and approved by processing a student petition form through the Registrar. J. COURSE RESOURCES You will need a pencil, a notebook (a loose-leaf binder is best), graph paper, and a straightedge. A folder for handouts is highly recommended. 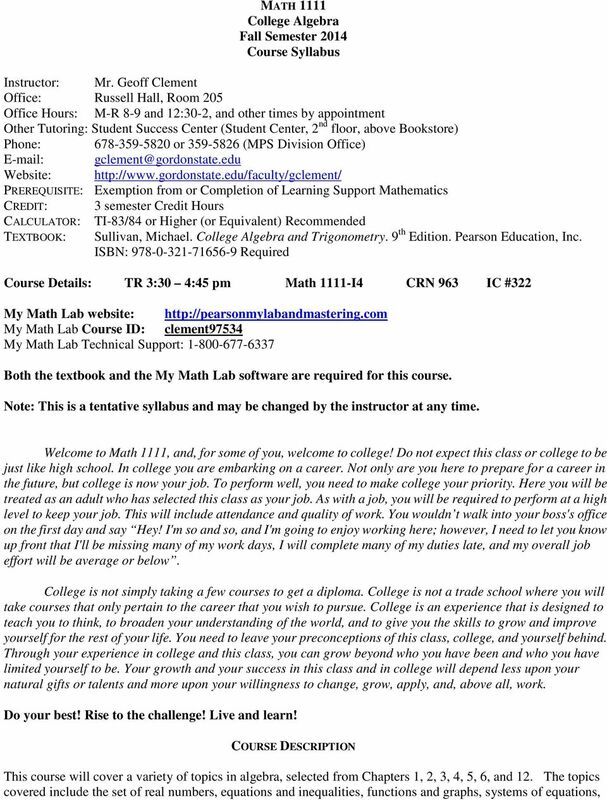 This course is enhanced by a web-based course software package called My Math Lab. Feel free to Ask My Instructor whenever you struggle, and use office hour help, as well. There are also significant course resources in Desire2Learn/GeorgiaVIEW. The course syllabi and course resources are also on your instructor s website at Besides office hours, the SSC (Student Center 2 nd floor) is available for tutoring assistance. Consider creating a study group with fellow classmates. Keys to Success in this class: (1) Have a goal for this class. Make this class a priority. You can succeed in this class! (2) Be on time every day. Don t miss class; when you must, communicate to your instructors. (3) Review class notes just before and just after class. (4) Read the text. Study the examples. Keep up with the pace of the class. (5) Practice, practice, and then practice some more. Do homework as soon as possible after class. (6) Ask questions. You have the right; asking questions shows you care and will often help others. (7) Read the directions carefully. On tests, start by unloading important formulas and concepts. (8) Actively listen in class. Take good notes. (9) Use our tutoring center whenever you need help. Don t let things snowball. (10) Correct any mistakes you make on quizzes and tests. (11) Be a lifelong learner. Live and learn! Rise to the challenge of college-level mathematics! *Treat this class like any job; take deadlines seriously. The schedule below is tentative but should be very close to our pace. 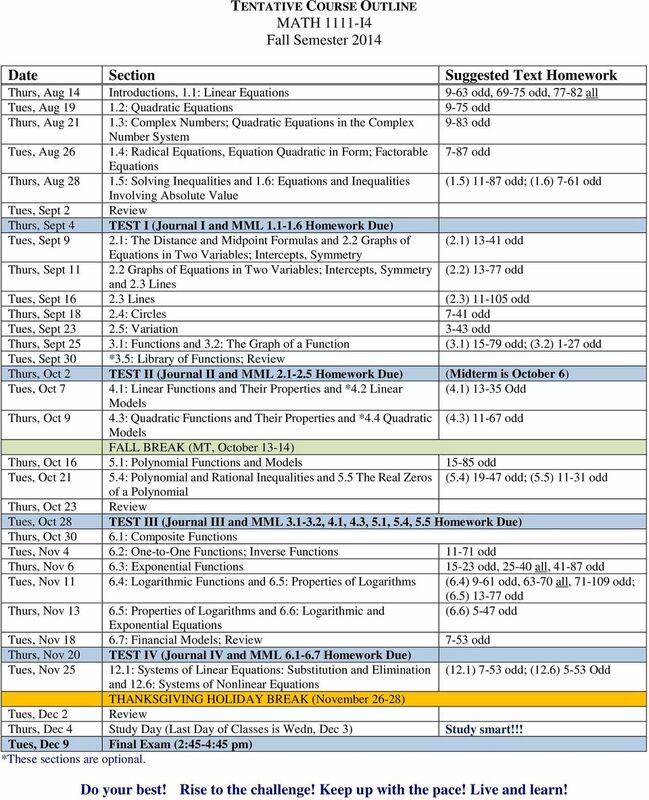 5 TENTATIVE COURSE OUTLINE MATH 1111-I4 Fall Semester 2014 Date Section Suggested Text Homework Thurs, Aug 14 Introductions, 1.1: Linear Equations 9-63 odd, odd, all Tues, Aug : Quadratic Equations 9-75 odd Thurs, Aug : Complex Numbers; Quadratic Equations in the Complex 9-83 odd Number System Tues, Aug : Radical Equations, Equation Quadratic in Form; Factorable 7-87 odd Equations Thurs, Aug : Solving Inequalities and 1.6: Equations and Inequalities (1.5) odd; (1.6) 7-61 odd Involving Absolute Value Tues, Sept 2 Review Thurs, Sept 4 TEST I (Journal I and MML Homework Due) Tues, Sept 9 2.1: The Distance and Midpoint Formulas and 2.2 Graphs of (2.1) odd Equations in Two Variables; Intercepts, Symmetry Thurs, Sept Graphs of Equations in Two Variables; Intercepts, Symmetry (2.2) odd and 2.3 Lines Tues, Sept Lines (2.3) odd Thurs, Sept : Circles 7-41 odd Tues, Sept : Variation 3-43 odd Thurs, Sept : Functions and 3.2: The Graph of a Function (3.1) odd; (3.2) 1-27 odd Tues, Sept 30 *3.5: Library of Functions; Review Thurs, Oct 2 TEST II (Journal II and MML Homework Due) (Midterm is October 6) Tues, Oct 7 4.1: Linear Functions and Their Properties and *4.2 Linear (4.1) Odd Models Thurs, Oct 9 4.3: Quadratic Functions and Their Properties and *4.4 Quadratic (4.3) odd Models FALL BREAK (MT, October 13-14) Thurs, Oct : Polynomial Functions and Models odd Tues, Oct : Polynomial and Rational Inequalities and 5.5 The Real Zeros (5.4) odd; (5.5) odd of a Polynomial Thurs, Oct 23 Review Tues, Oct 28 TEST III (Journal III and MML , 4.1, 4.3, 5.1, 5.4, 5.5 Homework Due) Thurs, Oct : Composite Functions Tues, Nov 4 6.2: One-to-One Functions; Inverse Functions odd Thurs, Nov 6 6.3: Exponential Functions odd, all, odd Tues, Nov : Logarithmic Functions and 6.5: Properties of Logarithms (6.4) 9-61 odd, all, odd; (6.5) odd Thurs, Nov : Properties of Logarithms and 6.6: Logarithmic and (6.6) 5-47 odd Exponential Equations Tues, Nov : Financial Models; Review 7-53 odd Thurs, Nov 20 TEST IV (Journal IV and MML Homework Due) Tues, Nov : Systems of Linear Equations: Substitution and Elimination (12.1) 7-53 odd; (12.6) 5-53 Odd and 12.6: Systems of Nonlinear Equations THANKSGIVING HOLIDAY BREAK (November 26-28) Tues, Dec 2 Review Thurs, Dec 4 Study Day (Last Day of Classes is Wedn, Dec 3) Study smart!!! Tues, Dec 9 Final Exam (2:45-4:45 pm) *These sections are optional. Do your best! Rise to the challenge! Keep up with the pace! Live and learn!